Over the course of the season, these girls have played every kind of game there is. There have been wins, losses, ties, amazing upsets, and thrashings. Of course, witnessing a thrashing is the worst. Uninspired offense, sloppy goaltending, lackluster defense, opposing players that are twice as big as the home team... Whatever the reason, it's always a bummer. So, here we are, at the last minute of the last game of the season. Down by several points. Coaches decide to finish the game on a festive note, and empty the benches onto the ice. It's a free-for-all... the chaos on the rink threatening to widen an already large gap on the scoreboard. Not that it matters at this point, but, still. Groaning, I survey the horde making its way toward the goal... where my girl crouches, a pile of gear wrapped in a red jersey. Anyway... the horde is coming, and I'm hoping for damage control, is all. That's when two teammates glide up beside her, and take their posts. They are all smiling. The horde arrives. Then the shot. Gloves, skates, sticks everywhere. The puck squirts out of the melee, into the corner. No goal. Then, thankfully, the buzzer. 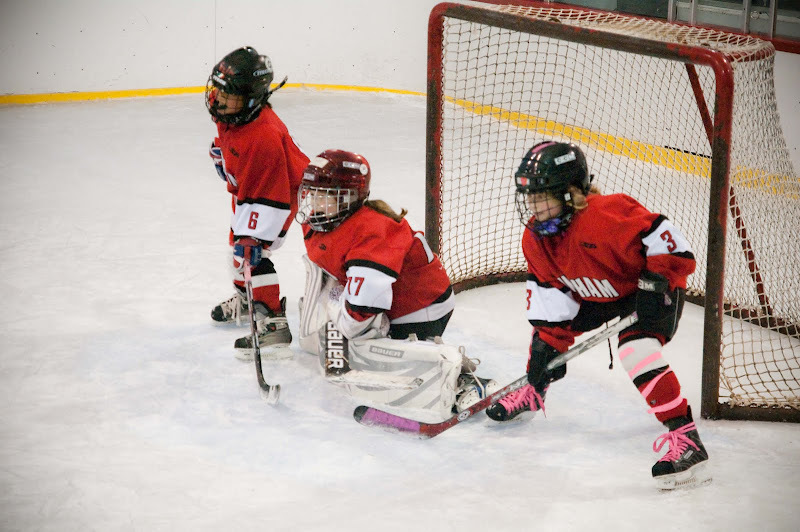 A confession: I have been a reluctant Hockey Mom. Until now. To love the game, to become a team... what else is there? We got our money's worth, for sure. So glad that it was such a great team and team experience for her. You paint a verbal picture just as well as you take them with a camera. I enjoy your work very much. What do the girls do in the Spring?